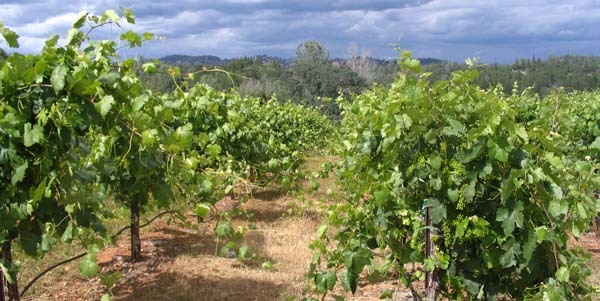 Barbera, a popular grape of the Piedmont region of Italy, has long been planted in California’s Central Valley and used anonymously as a blending grape based on its tremendous propensity to maintain high acid levels in hot climates. Its value as a stand-alone varietal wine has only been appreciated in California on a wide scale in the last 10 years or so, with bottlings from El Dorado and Amador counties in particular showcasing the potential of this low tannin grape. That said, barbera remains a handy blending grape for red wines due to its ample acidity and fruity characteristics. Our barbera grapes are planted on a predominantly eastern-facing slope of Shaker Ridge Vineyard, to take advantage of the morning sun during the early spring when barbera’s characteristically early emerging vines would be susceptible to frost damage. Approximately 40% of our barbera is clone 02 planted on the classic drought- and phylloxera-resistant rootstock St. George. Another 20% each of the same 02 clone is planted on two other drought-resistant rootstocks, 110R and 1103P. The remaining 20% of the barbera is the Montevina clone planted on 1103P rootstock. All the barbera are trained on a vertical cordon. The soils for most of the barbera vineyard are deep, red clay loam granitic soils, becoming more shallow at the northern end due to large slabs of quartz near the surface. 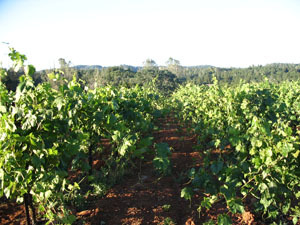 The barbera grapes, despite their early start, ripen later than the primitivo, generally in the mid-September to mid-October range at Shaker Ridge.